UPDATE: Reader David W. sent me the above additional image of the bridge manufactured by Lionel, for their electric train layouts, from 1928 to 1942. This miniature is 30" long, 11" high and shows up periodically on eBay. Reader, Scott D., wrote the following about replica of an unusual bridge in NYC. “Hell Gate Bridge, or the New York Connecting Railroad Bridge, contrasts sharply with nineteenth-century descriptions of the channel that it spans. Named for the dangerous rocks and perilous waters at the confluence of the East and the Harlem Rivers, Hell Gate is surrounded by Manhattan, Queens, and three islands. The Bridge was conceived in the early 1900s it was built to complete the linkage of the New York, New England, and Long Island rail line. Construction was overseen by engineer Gustave Lindenthal and architect Henry Hornbostel had previously been responsible for the redesign of both the Manhattan and Queensboro Bridges. Lindenthal, who served in 1902 -1903 as Commissioner of Bridges, firmly believed that a bridge could be both technologically sound and aesthetically pleasing. Hornbostel made the design changed to smooth concrete to soothe concerns that asylum inmates on Wards and Randall's islands would climb the piers to escape. The engineering was so precise that when the last section of the main span was lifted into place, the final adjustment needed to join everything together was a half inch. The bridge was completed on September 30, 1916. It was the world's longest steel arch bridge until the Bayonne Bridge was opened in 1931 and was surpassed again by the Sydney Harbor Bridge in 1932. In the late 1980's and early 1990's, Senator Daniel Patrick Moynihan, who spent his childhood near the bridge in Astoria, lobbied to have the Hell Gate Bridge refurbished. Although the nearby Triborough Bridge was being maintained and repainted constantly, the Hell Gate Bridge had not been painted since it opened in 1916. Buttressed by a 1991 article in The New Yorker on what Moynihan called "a great engineering miracle," Congress appropriated $55 million to repair and refurbish the Hell Gate Bridge. A unique color was even selected for the bridge paint: "Hell Gate Red." The restoration project was completed in 1996. 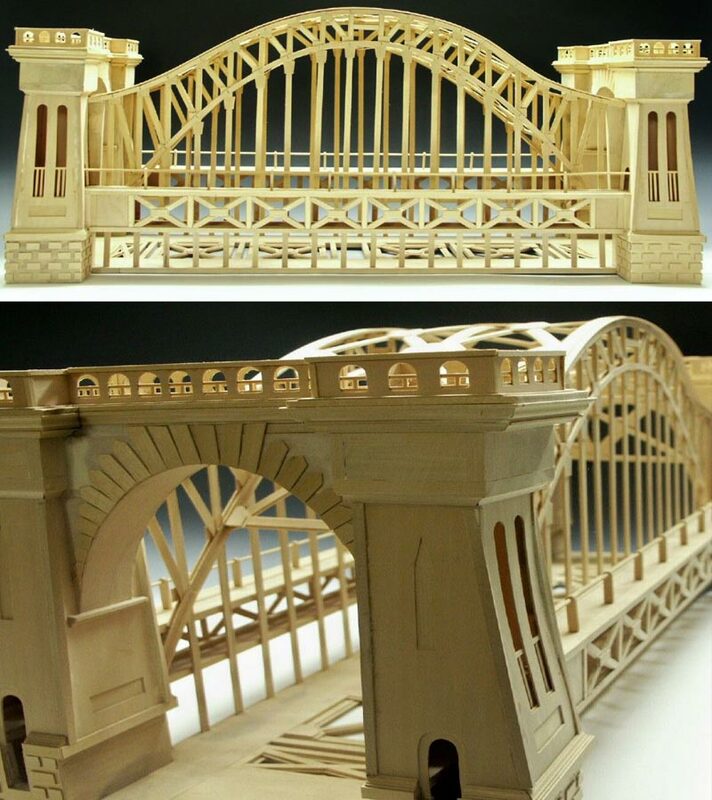 A few miniature replicas of the bridge have been made and one is made out of wood. Each piece is exactly like the original bridge. I was told this is an engineering model of the bridge. 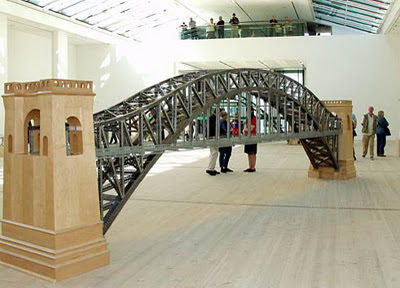 Interesting, but not really a souvenir is the Chris Burden’s Hell Gate Bridge that is a piece of his bridge sculpture series. 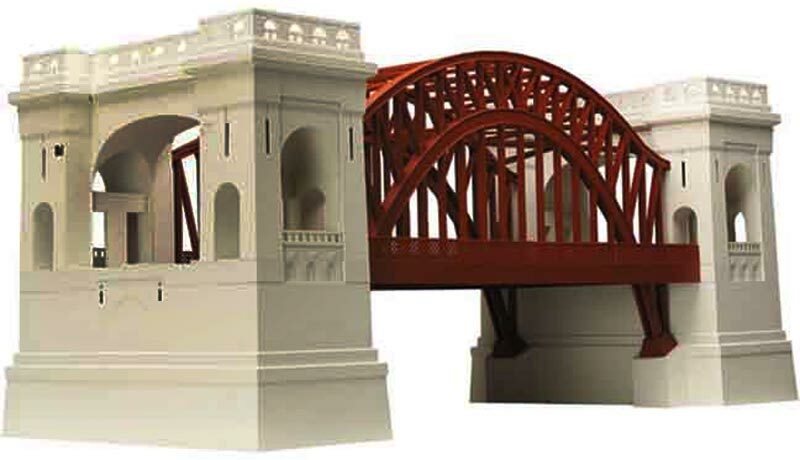 The 28-foot-long, 7 1/2 -foot-high model of New York City's Hell Gate Bridge is fashioned of metal toy construction parts. The next time you’re traveling by train to Boston be sure to know you’re in good hands going over Hell’s Gate.” – Scott D.